I’m going to have to keep my eyes open for some of these. I bet they grow around here! We gather wild greens from the field daily, and mustard is currently the star attraction– buds as broccoli, flowers and young greens in salads, and cooked older leaves. 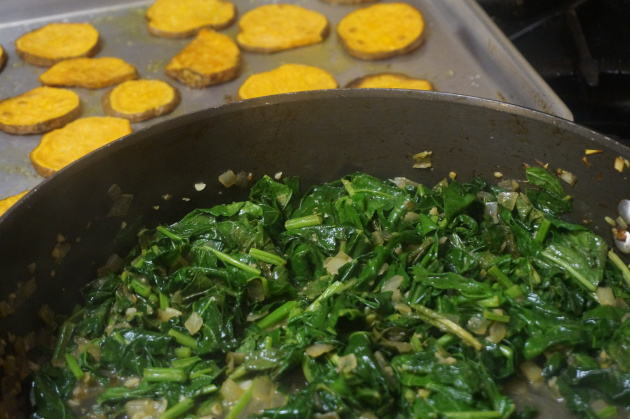 I think these hold up even better, in flavor and texture, to sauteing than does spinach. We often mix with dock leaves for a bright lemony accent. 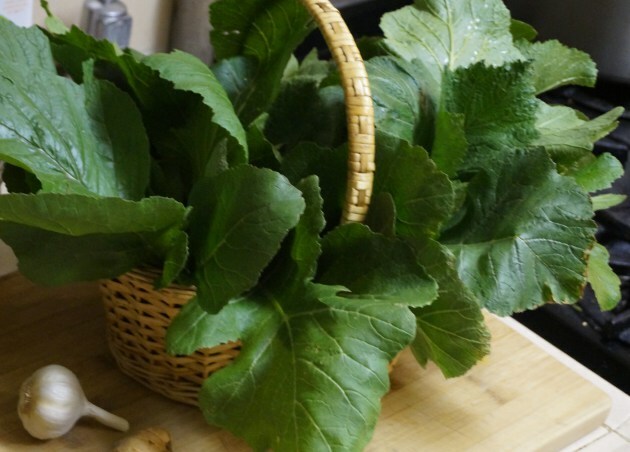 Mustard greens are easy to prepare, incredibly healthful, and delicious. They are a wonderful side to all sorts of meat, fish, polenta, or grain. We enjoyed them last night with fried pork chops and sweet potatoes. The dash of hot sauce adds no heat to speak of– only a bit of vinegar and spark of extra flavor. Serves 3-4.